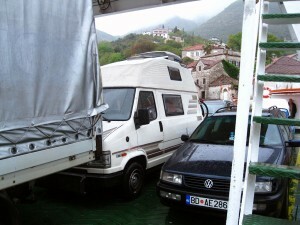 Entering Montenegro – 14/04/11 | Camperissimo! awesome irish tan there dude! Gad to see you are having a great trip! As we waited at the border station to cross into Montenegro yesterday, a young man wearing a tracksuit bounded out from behind the passport control booth and over to our van. “Every car driving in Montenegro needs to buy a yearly eco-sticker” he told us, “that’ll be €10 please!”. David and Oihana, the camper van friends we met in 2010, had warned us about the border travelling south into Albania, but entering Montenegro we hadn’t been expecting anything dodgy. The sticker he offered to us looked reassuringly official, much like a vignette, and so we were fairly sure we hadn’t been conned. The five metre drive from there to the passport booth passed without incident. Thereafter, the unhappy-looking man at the booth pleasantly informed us that he wanted to see ALL of our documents. He might as well just asked us “which documents don’t you have?”, that would have made things more straightforward. What we didn’t have, as it turned out, was a nondescript green slip which is issued with every car insurance policy. No matter that you can’t register a car at all in Germany without insurance. Fortunately the border guard was able to direct us to an insurance office (conveniently situated just metres away in a converted shipping container) where two nice gentlemen (also wearing tracksuits) would be happy to issue us a piece of green paper for the very reasonable price of €15, thankyouverymuch. You have to respect how comfortable the Montenegrins obviously feel with the EURO, their adopted currency, despite the fact that Montenegro is not yet a member of the EU. Although they don’t/can’t print their own Euros, this has been the official currency here since 2002, which it replaced the Deutschmark. The drive from the border to the bay of Kotor was accompanied by torrential rain, which helped us confirm beyond any doubt that the our new windscreen works. From the north of the bay we drove onto a chain-drawn car ferry, which was a fantastic experience, and shortened the journey to our destination, Cetinje, by at least an hour. From there we continued along the coast to the town of Budva – the south side of which is a monstrous mass-tourism-work-in-progress – and turned up into the mountains and away from the Adriatic. In Baška Voda the wind had blown so hard that we had to re-park the van at a less provocative angle. In Dubrovnik, as the sun had beat down, I had pranced around gaily in shorts, t-shirt and sandals and amounted quick an impressive sunburn. En route to Kotor we had experienced thick driving rain, and now it was … snowing. Heavily! Travelling in spring you might throw in a couple of light jackets, a pair of hiking socks and even a flat cap, but neither of us were prepared for this. At any rate: praise the lord that the van has heating because last night it was flipping freezing. Most importantly: almost all Montenegrins that we have met have been extremely friendly, helpful and smiled a lot! 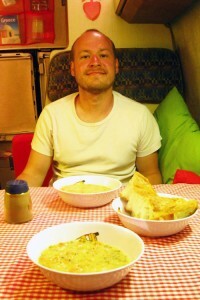 This entry was posted in Camper Trip April 2011 and tagged 2011, Cetinje, diary, dodgy!, Montenegro, rain, snow. Bookmark the permalink.